MANDATORY MICHIGAN NURSING CEU. This nursing CEU course fulfills the new requirement for 2 contact hours in pain and symptom management for MI nursing license renewal in 2019 and beyond. Covers understanding and responding to misuse, abuse, and diversion of opioids in providing pain management; assessing risk for substance abuse disorders; and efforts to address the problem. Discuss the scope of the misuse, abuse, and diversion of prescribed pain medications. Identify risk factors and aberrant drug-related behaviors indicating potential misuse/abuse of prescribed pain medications. List the most commonly abused and/or diverted drugs and their sources. Summarize nonpharmacologic and pharmacologic interventions for managing chronic pain. Discuss the components of responsible opioid prescribing and prescribing guidelines for chronic and acute pain. Describe Michigan initiatives aimed at preventing prescription drug abuse and diversion. From 1999–2016, more than 350,000 people died from an overdose involving any opioid, including prescription and illicit opioids. Around 66% of the more than 63,600 drug overdose deaths in 2016 involved an opioid. In 2016, the number of overdose deaths involving opioids (including prescription opioids and illegal opioids like heroin and illicitly manufactured fentanyl) was five times higher than in 1999. 2,729 people died from drug overdoses in 2017, representing more deaths than those from car crashes. 1,941 people died from opioid overdoses in 2017. 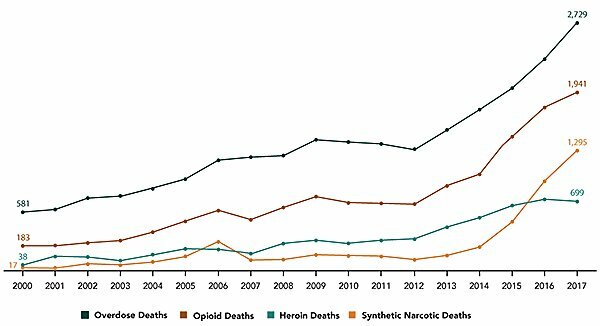 1,295 people died from synthetic narcotic overdoses (including fentanyl) in 2017. 699 people died from heroin overdoses in 2017. 863 babies were exposed to drugs at birth in 2016 (neonatal abstinence syndrome). Overdose deaths increased 17-fold from 1999 to 2016, from 99 to 1,699. 11.4 million prescriptions for painkillers were written in 2015, equaling about 115 opioid prescriptions per 100 people. There has also been some progress. For instance, the number of opioid prescriptions dispensed decreased by 10.7% from 2015 to 2017, while the overall number of prescriptions dispensed for Schedules II–V controlled substances (i.e., all drugs classified as having an acceptable medical use) decreased by 7.1% during that same timespan. For the first time since 2011, the total number of controlled substance prescriptions dispensed in Michigan fell below 20 million (LARA, 2018). Prescription drug misuse and nonmedical use: Taking a medication in a manner or dose other than prescribed; taking someone else’s prescription, even if for a legitimate medical complaint such as pain; or taking a medication to feel euphoria (i.e., to “get high”). The term nonmedical use of prescription drugs also refers to these categories of misuse (NIDA, 2016). Prescription drug abuse: Taking prescription drugs to feel euphoria (i.e., to “get high”) (NIDA, 2016). Illicit drug use: Illegal use of drugs, including the nonmedical use of prescription drugs (SAMHSA, 2013). Addiction: A chronic, relapsing brain disease that is characterized by compulsive drug seeking and use, despite harmful consequences. It is considered a brain disease because drugs change the brain’s structure and how it works. These brain changes can be long-lasting and lead to many harmful, often self-destructive, behaviors (NIDA, 2014). In the 1990s, “underprescribing” for pain was the predominant concern because of the physiological and psychological effects caused by unrelieved pain. Concerns about undertreatment of pain despite the availability of effective drugs led to a movement toward more aggressive pain management, which became a driving force behind more liberal opioid prescribing. The economic cost is far reaching and can also be seen in government programs. Thousands of Medicaid beneficiaries and providers have been involved in potentially fraudulent purchases of controlled substances. This has resulted in millions of dollars in payments for prescriptions to patients who obtained controlled substances from multiple health practitioners without the prescribers’ knowledge of the other prescriptions (i.e., “doctor shopping”) (U.S. DHHS, 2012). Likewise, there is a staggering economic burden to care for babies born exposed to drugs and babies with a diagnosis of neonatal abstinence syndrome, which is a group of problems that occur in newborns who were exposed to addictive illegal or prescription drugs in utero. To examine risks for substance abuse or drug diversion, it is important to look at general risk factors as well as specific population risk indicators. There are a number of physiologic, behavioral, and genetic risk factors that can predispose any person to abuse of opioid medication. The factor that appears to be most strongly predictive of drug abuse, misuse, or other aberrant drug-related behaviors after initiation of chronic opioid therapy is a personal or family history of alcohol or drug abuse (Chou et al., 2009). Recognizing and responding to risk indicators is an important nursing responsibility that can help reduce prescription drug abuse and diversion among patients and colleagues. Pain medications/narcotics. Opioid pain relievers (narcotics) are the most commonly diverted controlled prescription drugs (SAMHSA, 2013). Opioid medications are effective for the treatment of pain and have been used appropriately to manage pain for millions of people, however increased rates of abuse and overdose deaths have raised concerns about proper use of these medications in the treatment of chronic pain. Stimulants. Stimulants are prescribed primarily for treatment of attention deficit hyperactivity disorder (ADHD) and narcolepsy. They may also be used as an adjunct medication in the treatment of depression. When taken nonmedically, stimulants can induce a feeling of euphoria and thus have a high potential for abuse and diversion. They also have a cognitive enhancement effect that has contributed to nonmedical use by professionals, athletes, and older individuals. Nonmedical use of stimulants poses serious health consequences, including addiction, cardiovascular events, and psychosis (NIDA, 2017). * See table “Controlled Substances and Dispensing Restrictions” later in this course. Data reveals that a primary source of drug diversion for nonmedical use comes from friends and relatives, and users often obtain the drugs free of charge (SAMHSA, 2013). The perception that prescription drugs are safe and that it is acceptable to share them with friends and family members has fueled this disturbing trend. The U.S. DEA has provided a number of “red flags” for healthcare professionals to be aware of so that they can report suspected drug diversion by both prescribers and dispensers. A number of studies aimed at evaluating the effectiveness of opioid therapy in chronic pain have been published. Based on current evidence, the value of long-term opioid use in the treatment of chronic pain is questionable, and epidemiological studies report the failure of opioids to actually improve function and quality of life in chronic pain patients (Dowell et al., 2016). Long-term use of opioids can lead to a number of adverse consequences, including hormonal and immune system compromise, tolerance, hyperalgesia, and addiction. For most pain conditions, NSAIDS are the cornerstone of treatment. They reduce inflammation and relieve pain without inducing tolerance or dependence. They have proven to be effective for relief of pain resulting from trauma, arthritis, surgical procedures, and cancer, but a ceiling effect (maximum level of pain relief that cannot be exceeded even with more medication) reduces their efficacy with more severe pain conditions. NSAIDS are also associated with risk for gastric irritation and bleeding. There are three categories of NSAID medication: aspirin, ibuprofen/naproxen, and cetecoxib (Celebrex). When clinicians assess chronic pain patients for opioid therapy, it is important to recognize two categories of risk: 1) medical conditions that increase their risk for adverse events (e.g., respiratory depression) and 2) physiologic, behavioral, and genetic risk factors. Adverse effects: Falls, decreased cognitive function, constipation, etc. In 1971, in response to the growing misuse and abuse of drugs in the 1960s, Congress passed the Comprehensive Drug Abuse, Prevention, and Control Act. The act created a schedule of controlled substances, ranking them according to their potential for abuse. Clinicians should always exercise caution when prescribing opioids and monitor all patients closely (as described in the recommendations below). The recommendations are divided into three specific areas for consideration: 1) determining when to initiate or continue opioids for chronic pain; 2) opioid selection, dosage, duration, follow-up, and discontinuation; and 3) assessing risk and addressing harms of opioid use. Use immediate-release opioids when starting. When starting opioid therapy for chronic pain, clinicians should prescribe immediate-release opioids instead of extended-release/ long-acting opioids. Evaluate benefits and harms frequently. Clinicians should evaluate benefits and harms with patients within one to four weeks of starting opioid therapy for chronic pain or of dose escalation. Clinicians should evaluate benefits and harms of continued therapy with patients every three months or more frequently. If benefits do not outweigh harms of continued opioid therapy, clinicians should optimize other therapies and work with patients to taper opioids to lower dosages or to taper and discontinue opioids. Use strategies to mitigate risk. Before starting and periodically during continuation of opioid therapy, clinicians should evaluate risk factors for opioid-related harms. Clinicians should incorporate into the management plan strategies to mitigate risk, including considering offering naloxone (Narcan) when factors that increase risk for opioid overdose, such as history of overdose, history of substance use disorder, higher opioid dosages (≥50 MME/day), or concurrent benzodiazepine use, are present. Review PDMP data. Clinicians should review the patient’s history of controlled substance prescriptions using state prescription drug monitoring program (PDMP) data to determine whether the patient is receiving opioid dosages or dangerous combinations that put him or her at high risk for overdose. Clinicians should review PDMP data when starting opioid therapy for chronic pain and periodically during opioid therapy for chronic pain, ranging from every prescription to every three months. The Prescription Drug and Opioid Abuse Commission, Opioid Prescribing Engagement Network (OPEN), and University of Michigan Injury Prevention Center partnered to create acute pain recommendations for surgeons, emergency departments, and dentists when treating acute pain. The recommendations are part of a preventative approach intended to provide alternatives to opioids and controlled substances for the treatment of acute pain. Addressing opioid prescribing during the acute-care period among those patients not using opioids has the greatest potential to reduce the number of new chronic opioid users and minimize unintended distribution of prescription opioids into communities. Existing public health measures currently focus on palliative strategies that target chronic opioid use. A strategy that focuses on the prevention of opioid dependence requires targeting opioid-naive patients prior to opioid dependence (OPEN, 2018a). A summary of selected best practices is included in the tables below. Discuss the expectations regarding recovery and pain management goals with the patient. Educate the patient regarding safe opioid use, storage, and disposal. Determine the patient’s current medications (e.g., sleep aids, benzodiazepines), and any high-risk behaviors or diagnoses (e.g., substance use disorder, depression, or anxiety). Do not provide opioid prescription for postoperative use prior to surgery date. Consider nerve block, local anesthetic catheter, or an epidural when appropriate. Consider nonopioid medications when appropriate (e.g., ketorolac). Meperidine (Demerol) should not be used for outpatient surgeries. If opioids are deemed appropriate therapy, oral is preferred over IV route. Ensure all nursing, ancillary staff, and written discharge instructions communicate consistent messaging regarding functional pain management goals. The prescription drug monitoring program (PDMP) must be accessed prior to prescribing controlled substances Schedules II–V, in compliance with Michigan law. Nonopioid therapies should be encouraged as a primary treatment for pain management (e.g., acetaminophen, ibuprofen). Nonpharmacologic therapies should be encouraged (e.g., ice, elevation, physical therapy). Do not prescribe opioids with other sedative medications (e.g., benzodiazepines). Short-acting opioids should be prescribed for no more than 3–5 day courses (e.g., hydrocodone, oxycodone). Fentanyl or long-acting opioids (e.g., methadone, OxyContin) should not be prescribed to opioid naive patients. Consider offering a naloxone co-prescription to patients who may be at increased risk for overdose, including those with a history of overdose, a substance use disorder, those already prescribed benzodiazepines, and patients who are receiving higher doses of opioids (e.g., >50 MME/Day). Educate patient and parent/guardian (for minors) regarding safe use of opioids, potential side effects, overdose risks, and developing dependence or addiction. Educate patient on tapering of opioids as surgical pain resolves. Refer to the website opioidprescribing.info for free prescribing recommendations for many types of surgeries. Refer and provide resources for patients who have or are suspected to have a substance use disorder. Nonopioid therapies should be used as first-line therapy. Lost or stolen prescriptions should not be replaced. The prescription drug monitoring program (PDMP) must be accessed prior to prescribing Schedules II–V controlled substances, in compliance with Michigan law. Consider care coordination and/or effective ED-based Screening, Brief Intervention, and Referral to Treatment (SBIRT) with patients who have suspected risky opioid use or frequent ED visits. Replacement methadone should not be provided in the ED. Nonopioid therapies (e.g., acetaminophen, ketorolac) are encouraged as primary or adjunctive treatments. Nonpharmacologic therapies (e.g., ice, splinting) should be utilized. The prescription drug monitoring program (PDMP) must be accessed prior to prescribing opioids, in compliance with Michigan law. Meperidine (Demerol) should not be used. Long-acting opioids (e.g., fentanyl, methadone, OxyContin) should not be prescribed. Short-acting opioids (e.g., hydrocodone, oxycodone) should be prescribed for no more than 3-day courses. Do not prescribe opioids with benzodiazepines and other sedatives. Information should be provided about opioid side effects, overdose risks, potential for developing dependence or addiction, avoiding sharing and nonmedical use, and safe storage and disposal. Consider offering a naloxone co-prescription to patients who may be at an increased risk for overdose, including those with a history or overdose, a substance use disorder, those already prescribed benzodiazepines, and patients who are receiving a higher doses of opioids (e.g., >50 MME/day). Prescription drug monitoring programs (PDMPs) are statewide electronic databases that gather information from pharmacies on controlled substances. Growing recognition that PDMPs are a vital tool for clinicians to address the prescription drug epidemic has led to increased public and private funding to support widespread expansion of these programs. According to a survey by the AMA Opioid Task Force, registrations with state-based PDMPs by physicians and other healthcare professionals grew from 471,896 in 2014 to 1,322,996 in 2016, demonstrating a 180% increase in use of PDMPs (AMA, 2017). MAPS is the prescription monitoring program for Michigan. MAPS is used to track controlled substances (Schedules II–V drugs). Dispensing practitioners who dispense Schedules II–V controlled substances are required to electronically report this prescription data to MAPS on a daily basis. Prescribers and dispensers can utilize the information in the MAPS database to assess patient risk, determine if patients are receiving controlled substances from other providers, and thus prevent drug abuse and diversion at the prescriber, pharmacy, and patient levels. MAPS online is available 24/7 to request MAPS reports. MAPS also allows law enforcement, government agencies, and benefit plan managers to register and submit requests for MAPS data. Requests are reviewed and approved by the MAPS administrator. Organized statewide and community efforts have been implemented in Michigan to improve the safe storage and disposal of prescription drugs. For example, Michigan-OPEN works with healthcare organizations, law enforcement, and community organizations to hold community opioid and medication “take-back” events twice a year. Through 27 simultaneous events held around the state in the spring of 2018, hundreds of families safely removed a total of more than 2,000 pounds of medication, including approximately 54,000 opioid medications from their homes, while also increasing awareness in the community about safe medication disposal. Michigan-OPEN online drug disposal resources also include an interactive map showing opioid disposal locations throughout the state. Currently, there is an epidemic of prescription drug abuse, diversion, and overdose deaths both in Michigan and across the country. Recent governmental reports indicate that death rates from drug overdose are still on the rise despite stepped-up efforts by public health authorities.